Dunollie tower with the Standard’s first flight at the International Gathering in 2009. 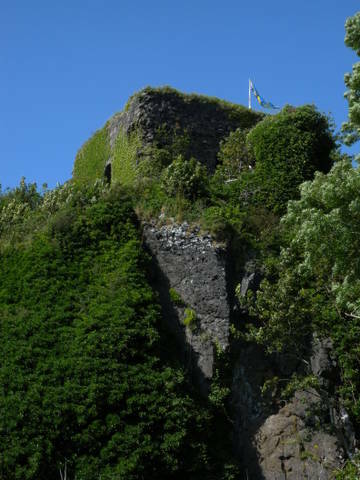 Dunollie Castle is at the center of Lorn and its adjacent islands, the area in which MacDougalls and their associated families find their historical and cultural roots. The Castle, a symbol of our Clan heritage, holds a commanding position overlooking the Sound of Kerrera, Oban Bay, and the Firth of Lorn. The Castle’s massive tower, which is perhaps six centuries old, dominates the ruins. The castle itself is considerably older, and the promontory on which it stands has hosted defensive sites for two millennia or more. Dunollie was one of the capitals of Dàl Riada, the most prominent early kingdom of the Gaels in Scotland lasting from late in the fifth into the ninth century. The promontory stood at the intersection of the inner passage running between the Lorn coast and the offshore islands, and the fast route along the lochs of the Great Glen to Scotland’s east coast. Its position astride major trade routes suggests that Dunollie was probably used from at least the Bronze Age. Limited archeological excavations were carried out on outer earthworks of Dunollie Castle in 1978. 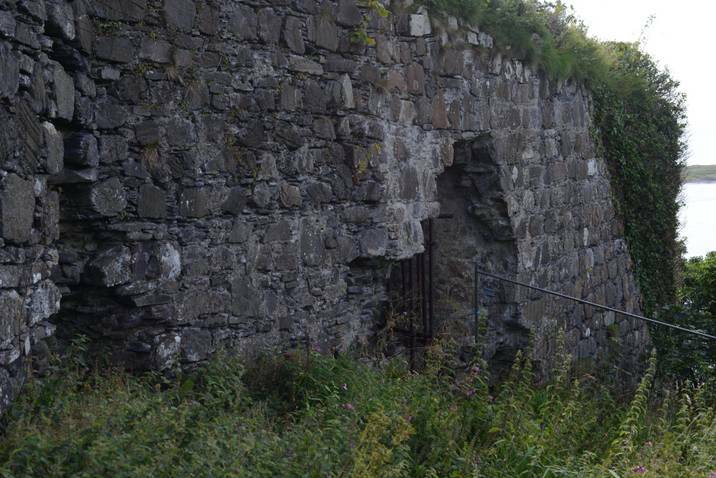 L. Alcock, in the RCAHMS Site Record for Dunollie Castle, writes that three older structural phases were identified in the excavation: The first two are thought to date from the late 7th-8th centuries AD, while the third appears to be a defensive work of the 13th century. The tower, with its six foot thick walls and imposing position, gives a feeling of ancient strength but this masks serious deterioration in critical parts of its external walls. External layers of stone have only loose mutual support over large areas. The stones at the base of a corner have fallen away leaving the outer upper corner unsupported. A side wall shows extensive loss of stone at its base. The deterioration is gathering pace, with the loss of additional corner stones last winter. The stones are falling close to the path around the castle, which may become dangerous to use in winter. 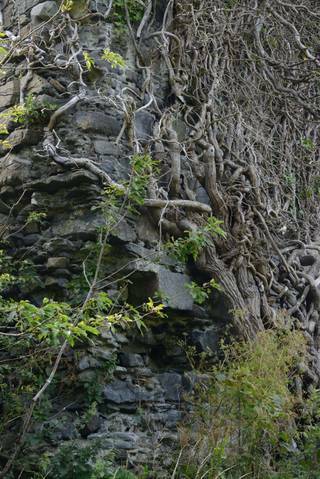 A structural engineer has described the Castle as being in a state of progressive collapse. this past summer. Deterioration at the corner of that wall. With substantial assistance from Historic Scotland the extensive studies needed to bring together a repair and consolidation plan have been carried out. Historic Scotland is an agency of the Scottish Government with a responsibility of safeguarding, and promoting the understanding and enjoyment of, Scotland’s historic environment. The next step is to commission technical experts to transform the repair and consolidation plan into a phases-of-work plan, which is essential for obtaining staged funding for a long-term repair program. It is important to develop requests for such funding as soon as possible. 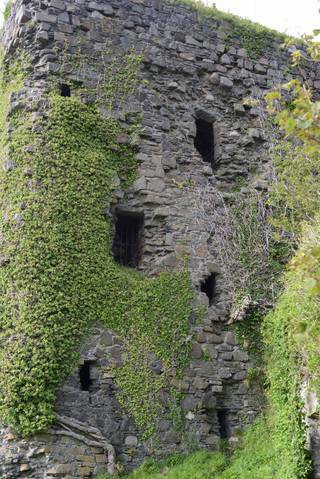 Stabilizing Dunollie Castle will require more than £1.3 million. Deterioration at the base of another wall of the castle. This entry was posted in Dunollie Castle Preservation, Our Heritage. Bookmark the permalink.